A study compared, through a survey of more than 13,000 people, emotions such as happiness, pain, stress, sadness and fatigue that users have depending on the means of transport in which they move. After the cyclists, the next happiest are the passengers in the car and then the car drivers. ” Bus and train users experience the most negative emotions, although a small part of this can be attributed to the fact that public transport is used disproportionately to get to and from work,” the study authors note. In addition to the proven benefits of physical exercise, this work shows that the mood of people can be affected in something as everyday as the means of transport in which it moves and its results can serve to improve the characteristics, frequencies and design of transport networks. Nowadays, any time is good for exercising. And if we can practice it while we go to work, much better. For this the bicycle is one of the best transports to practice outdoor sports. There are many other benefits of going to work by bike. If you are still thinking about it, consider it, we give you 7 good reasons to change your life. One of the most outstanding benefits of going to work on a bike is that we do sports. We move, we do exercise and in the process we get fit. As it is something we must do every day, maybe it will not be necessary to go to the gym so much. The pedaling gives us strength and flexibility, not only in the legs, but also in the rest of the body. As a consequence of this daily exercise, we lose weight and fat. If we eat correctly and take the bike to work, we will keep a good figure and fitness without too much effort. Getting to work by bike allows us to enjoy good weather. In all times of the year, the bicycle is a good transport that makes us enjoy the cool, the streets, the people … especially when the days get longer. We discover new sensations and colors, and in the afternoon we benefit from the breeze and the open air, after hours being locked up. If you are a student who is working on an assignment, essay or dissertation, you can pick your stuff and pedal to the nearest park where you can focus on your work in nature and away from, something that you do not imagine if you have to go by car. Have you thought about how much you can save per month on gas and subway and bus tickets? 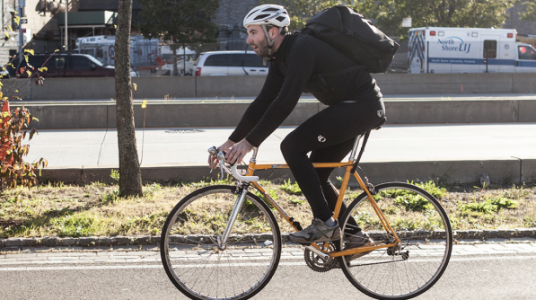 Going to work on a bike allows you to spend less money. We will go free, we can park anywhere, and we will not waste time or money when using another type of transport. The bicycle is one of the eco-friendliest transports that exist. In this sense, we are contributing to improve the planet, to be more sustainable and not damaging the environment. We do not spend on fuel and the atmosphere of the city is improved. Going on a bicycle to work is a real advantage. We can change the route to get to the office every day and we will always discover a new corner. Admire the architecture, the mountains, the new streets and squares, and gain health. As the use of the bicycle depends on oneself you will surely arrive at work earlier. You will save yourself from all kinds of traffic jams and you will not have to share space with the thousands of people that we find on public transport. It gives you a feeling of total freedom.